The aurora borealis, commonly known as the Northern Lights, is a distinctive feature of the Canadian skies and an important part of First Nations folklore. Scientists now know this brilliant natural light show is caused by particles from the Sun interacting with the Earth’s atmosphere, but what are the tools and methods they use to study this phenomenon? On this website you can find some of the fascinating tales about the Northern Lights that the First Nations peoples have passed down through their intricate oral histories. You can find up-to-date information on what scientists currently know about the Aurora Borealis, as well as the tools and methods they use to expand their knowledge as they study it from Earth and in space. 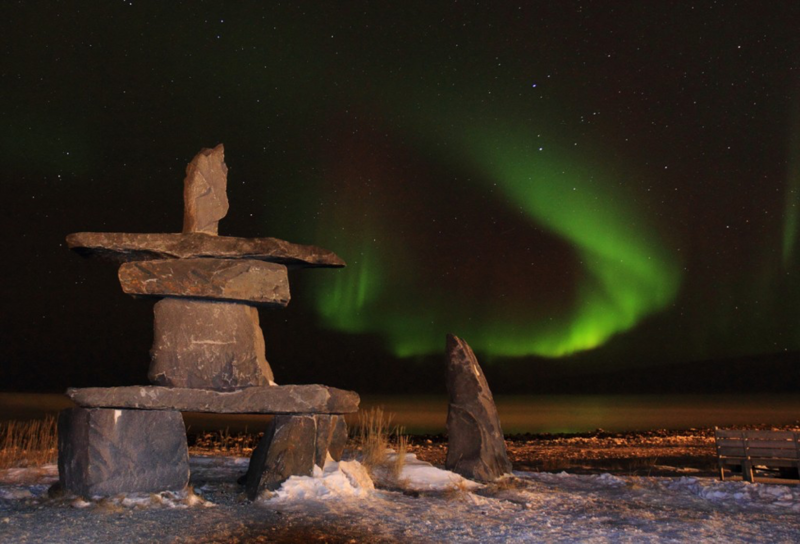 An inukshuk on Hudson Bay, Canada with the Aurora Borealis in the background. Galileo is believed to be the first to apply the name aurora to the northern lights. In 1619 he named it after Aurora, the Roman goddess of morning who appeared as a forerunner of the Sun prior to the start of each new day.1 Before Galileo’s naming of the auroras, Canada’s First Nations’ people created oral stories, based on their beliefs, to interpret a phenomenon they observed and heard but didn’t understand, the northern lights. These stories have been passed down from generation to generation and have become enshrined in the Indigenous worldview of auroras we know today. The stories differed from region to region as did the names applied to the auroras, even though they all attempt to interpret the same phenomenon. Translations of some Eskimo and American Indian names applied to the northern lights are: ball player, sky dwellers, that which moves rapidly, untimely birth, caribou cow, the old man, and dance of the dead.1 The folklore that evolved to interpret what Indigenous Canadians saw and heard varied from region to region just as much as the names given to the northern lights. Examples of some Indigenous Canadian folklore interpreting the auroras are listed below. As you can see, there is quite a variety of Indigenous Canadian folklore created to interpret what was observed and heard. It wasn’t until the nineteenth and twentieth centuries that scientific methodology was implemented to study and explain the phenomenon of the aurora borealis. Auroras in the northern hemisphere are called “aurora borealis” and auroras that occur in the southern hemisphere are called “aurora australis”. 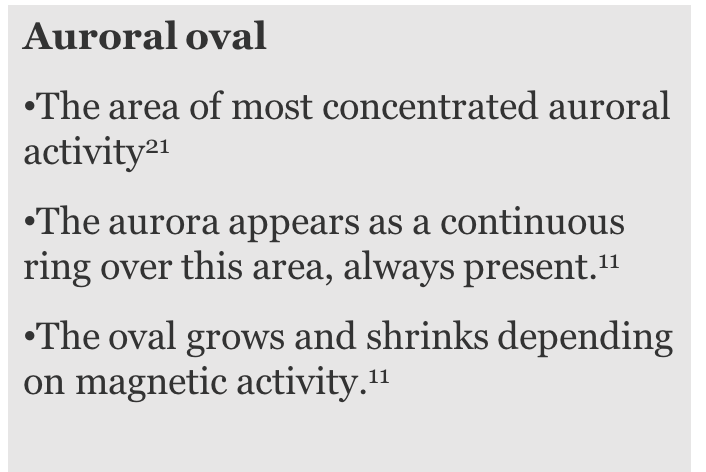 Both auroras appear as an irregularly shaped oval centered over their respective magnetic poles, in the area called the auroral oval. In most instances, northern and southern auroras are mirror-like images that occur at the same time, with similar shapes and colours. Green is the most common colour occurrence in auroras, however, red, yellow, blue and violet are seen occasionally. Auroras are the result of collisions between gaseous particles in the Earth’s atmosphere with charged particles released from the Sun’s atmosphere. The colour variations are due to the type of gas particles that are colliding. How do charged particles from the Sun get here? Normal Solar activity frequently ejects electrons and protons to flow out (typically) and make contact with the Earth’s magnetosphere. For auroras to appear, a lot of charged particles are needed from the Sun to collide with Earth’s atmosphere. This usually requires quite a large opening, such as a coronal hole, or a Sunspot. 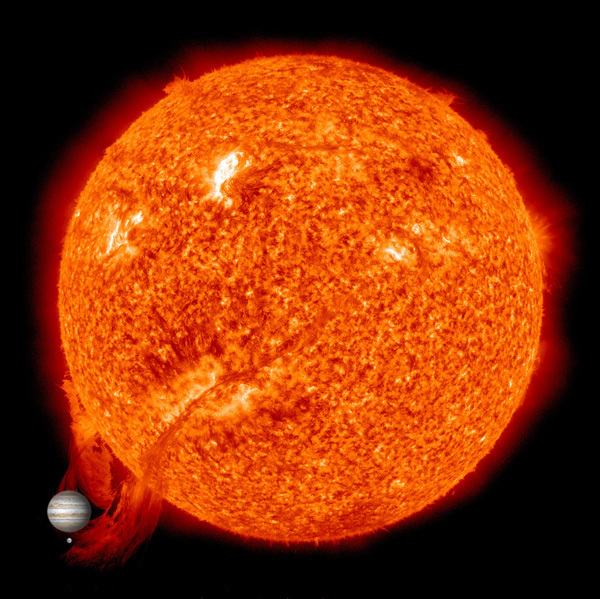 This Solar prominences article contains a number of videos explaining how charged particles escape from the Sun. When these charged particles are blown toward the Earth by the solar wind, they are largely deflected by the Earth’s magnetic field. 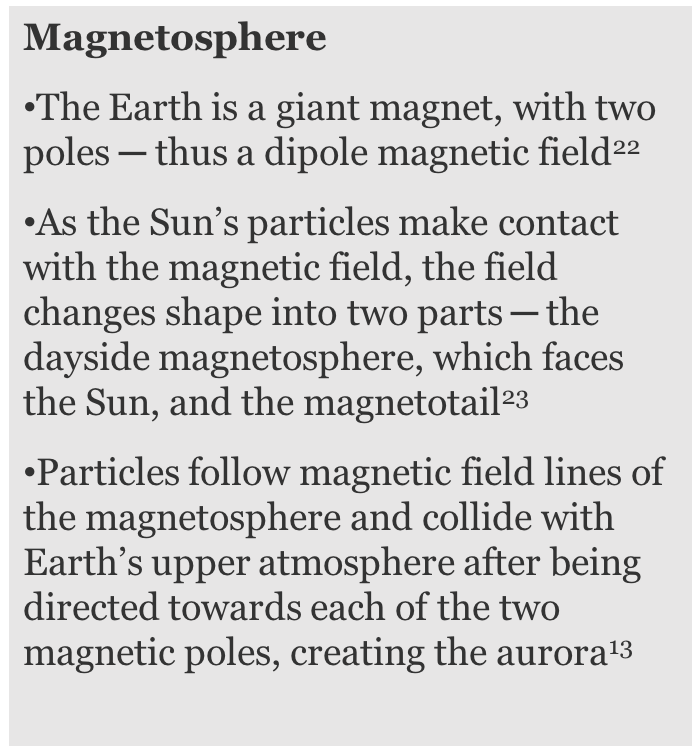 However, the Earth’s magnetic field is weaker at the two magnetic poles and therefore some particles enter the Earth’s atmosphere and collide with gas particles. These collisions emit light that we perceive as the dancing lights of auroras. Best place to watch auroras? Typically, watching from as close to one of the magnetic poles as possible will allow optimal viewing of auroras. Light pollution will ruin an aurora show, so the best place is away from lights. Typically in the north, driving as little as 30 minutes outside a city should eliminate light pollution. An unobscured view in northern direction (unless you’re so far north that auroras are directly overhead). This also depends on Kp strength of auroras. The current Kp strength can be viewed at this Aurora Forecast page. 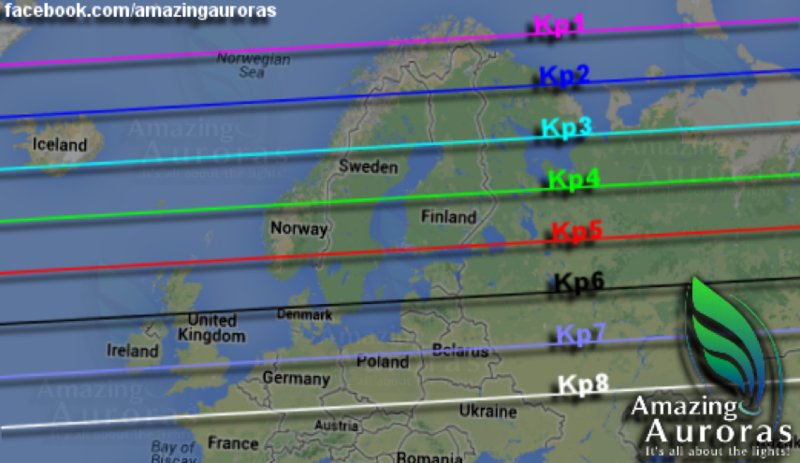 Graphic showing Kp strength required to view auroras by location. Kp Strength is a scale of geomagnetic activity consisting of numbers between 0-9, known as the planetary index. Numbers start at 0 and as the geomagnetic (aurora) strength increases, so too does the Kp number. Using this scale, it is easy to determine what Kp number you need to have a chance of seeing auroras where you are. 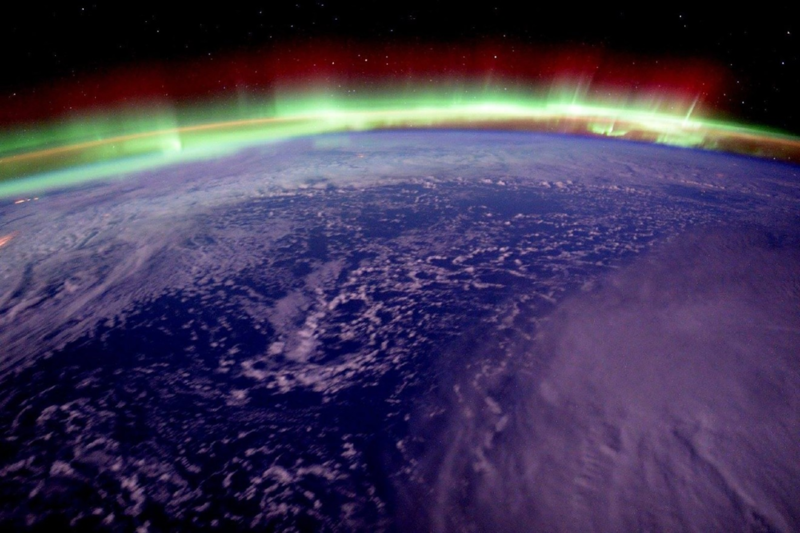 Of course, the International Space Station is also a good spot to view auroras! There are many reasons why scientists are interested in studying auroras. But how do they study this phenomenon? Canadian scientists are especially well-situated to conduct research on the Aurora Borealis, and they emerged as pioneers in the field by building and sending into space one of the world’s first artificial Earth satellites.29 A variety of observation methods have been used to study the Aurora Borealis including: detectors, satellites, and ground based methods. 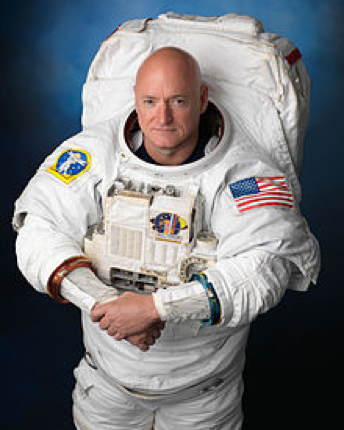 Scott Kelly, recently retired American astronaut and veteran of four space flights, the most recent consisting of 340 consecutive days living on the International Space Station, where he took numerous photographs of the Aurora Borealis as it appeared over North America. 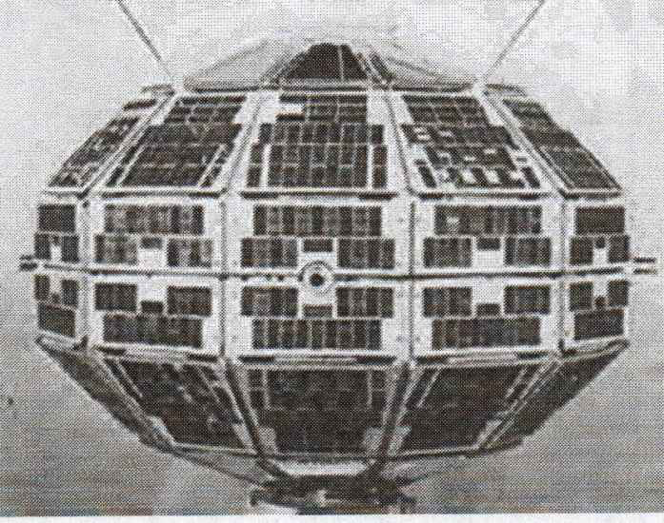 Alouette I, Canada’s first satellite. 1N, Davis, The Aurora Watcher’s Handbook (University of Alaska Press, Fairbanks, AK, 1992), pp. 163-168. 2D. J. Ray, “Legends of the Northern Lights”, The Alaskan Sportsman, April 1958, reprinted in S. I. Akasofu, Alaska Geographic (6), 2 (1979). 5S. Hearne, A Journey to the Northern Ocean: A journey from Prince of Wales’ Fort in Hudson’s Bay to the Northern Ocean in the years 1769, 1770, 1771, 1772 (The MacMillan Company of Canada, Toronto, Canada, 1958), pp. 221–222. 6Aurora Service, What is the Aurora Borealis, WWW document, (http://www.aurora-service.eu/aurora-school/aurora-borealis/). 7Aurora Service, All About the KP Index, WWW document, (http://www.aurora-service.eu/aurora-school/all-about-the-kp-index/). 8NASA, About Auroras, WWW document, (http://www.nasa.gov/mission_pages/SunEarth/news/gallery/aurora-index.html). 9M. Seeds, D. Backman, The Solar System, 9th ed. (Brooks Cole, Belmont, CA, 2015), pp. 163-164. 10H. Zell, NASA – The Mystery of Auroras, WWW document, (http://www.nasa.gov/mission_pages/themis/auroras/aurora_feature.html). 12H. Zell, THEMIS Overview, WWW document, (http://www.nasa.gov/mission_pages/themis/mission/index.html). 13University of California Multiverse, Themis Discoveries, WWW document, (http://cse.ssl.berkeley.edu/artemis/mission-discoveries.html). 14H. Mason, Science of Northern Lights Aurora Borealis, WWW document, (http://www.Suntrek.org/blog/science-northern-lights-auroras-borealis). 16E. 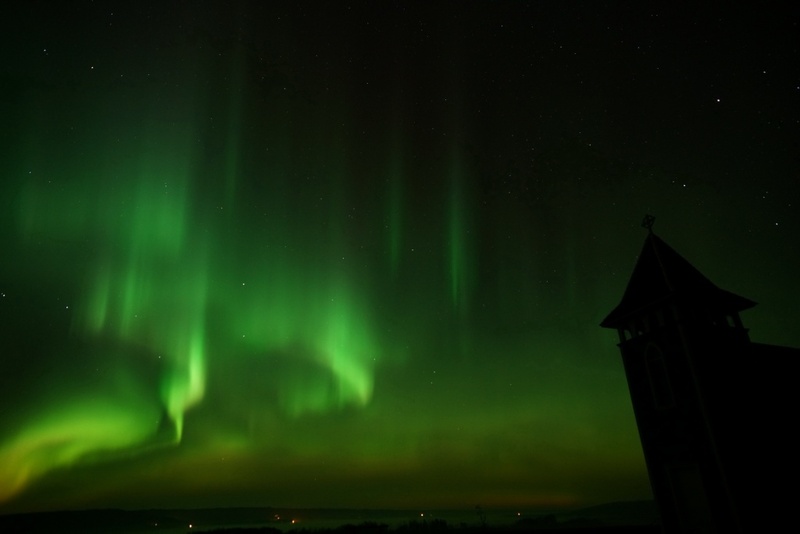 Howell, Scientists Spark Auroras in a Bottle for Traveling Northern Lights Show, WWW document, (http://www.space.com/22594-aurora-bottle-northern-lights-show.html). 17The John Hopkins University Sounding Rocket Program, General Description of Sounding Rockets, WWW document, (http://www.pha.jhu.edu/groups/rocket/general.html). 18T. Borroz, Rocket Flown through Northern Lights to Help Unlock Space Weather Mysteries, WWW document, (http://www.gizmag.com/rocket-to-fly-through-northern-lights-to-help-predict-space-weather/36139/). 19L. Baddeley, UNIS Students Are ‘Go’ for Rocket Launch, WWW document, (http://www.unis.no/unis-students-are-go-for-rocket-launch/). 20University of California Multiverse, Two Models, WWW document, (http://cse.ssl.berkeley.edu/artemis/mission-models.html). 21C. Landis, Studying the Aurora Australis from Antarctica, WWW document, (http://beyondpenguins.ehe.osu.edu/issue/polar-patterns-day-night-and-seasons/studying-the-aurora-australis-from-antarctica). 22University of California Multiverse, Earth’s Magnetosphere, WWW document, (http://cse.ssl.berkeley.edu/artemis/mission-mag.html). 23University of California Multiverse, Sun-Earth Connection, WWW document, (http://cse.ssl.berkeley.edu/artemis/mission-SunEarth.html). 24H. 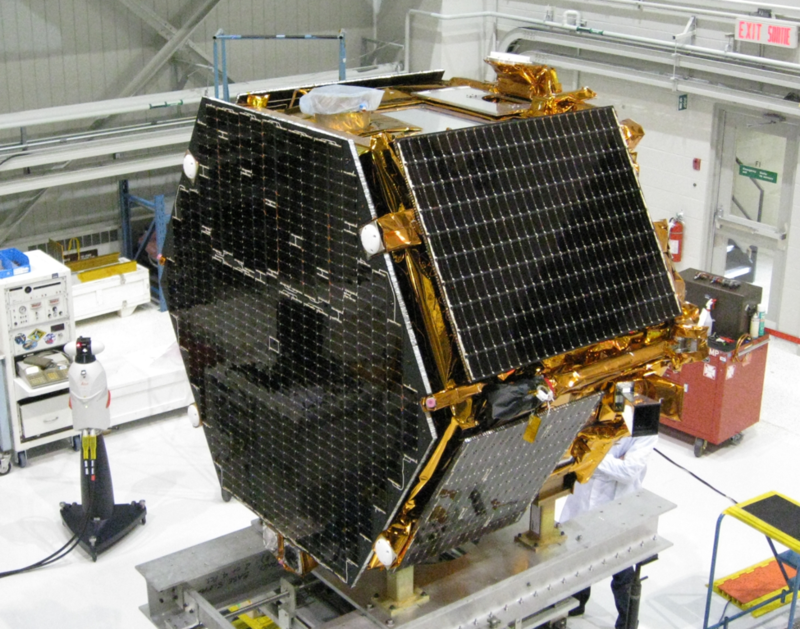 Zell, THEMIS – Ground-Based Magnetometer (GMAG) Array, WWW document, (http://www.nasa.gov/mission_pages/themis/spacecraft/gmag.html). 25C. Medred, Weather Balloons Launched into Alaska’s Aurora Borealis, WWW document, (http://www.adn.com/video/weather-balloons-launched-alaskas-aurora-borealis). 28SuperDARN Canada, SuperDARN Canada: In the land of living skies, WWW document, (http://superdarn.usask.ca/). 31GPS World Staff, UNB Technology Launched into Space, WWW document, (http://gpsworld.com/unb-technology-launched-into-space/).